In all honesty, mistakes were made last year with the program that after experience will not be repeated this year. 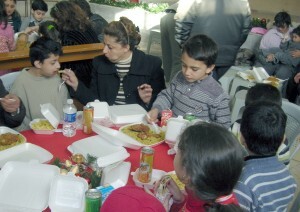 We had one huge hall in Jordan and planned on all the children being cared for at once. One day before the dinner, a huge snow and ice storm hit Jordan and closed most of the roads, and knocked out power in over 85% of the county. Several children froze to death the night before the dinner was supposed to take place. Because of the power outage, over a period of a week we had to hold several dinners at different, smaller locations as power became available. The Christmas for Refugees program is a separate budget item. The funds are maintained in a separate account. Last week $5,000 already donated for the program was wired to Lebanon to begin the organizational phase of the work that includes arranging the transportation of the children to the various dinners. We are on our way; this is something that can and will be accomplished with your help and the hand of our Almighty God. Please help tell others about our Christmas program for refugee kids. Tell you friends and family about the dedicated Internet site for the program at Christmas4Refugees.org or ChristmasForRefugees.org. There is also a Facebook page at: Facebook.com/ChristmasForRefugees. If you are a Facebook member please “like” the ChristmasForRefugees page to let your friends on Facebook know about it. If you have a Twitter account please Tweet about the Christmas for Refugee program and include the URL or Internet site address. The Post Card Campaign: Congressmen and Senators will return to Capitol Hill late on Wednesday, November 12, the day after Veterans Day. The first full day of business after the election will be Thursday the 13th and many of them will find huge stacks of our “Don’t fund Islamic terrorists” post cards waiting for them. This program has been a tremendous success. From the counts given to us by friendly congressional staffers, it appears that in some cases 85% of those receiving the cards in the mail signed them, put stamps on them, and mailed them to the congressmen and Senators. WOW! I have been so encouraged that I authorized 50,000 to be mail this week and then another 60,000 the first week of November. YES, I would like to send them to every social conservative in the United States, but that is not financially possible right now. As we raise more funds to mail cards they will get in the hands of people who will mail them to congressmen and Senators. However, I can’t take funds away from other projects such as aid programs. Those are dedicated programs and the funds are kept separately. Some folks have called our office asking us to make up post cards for friends and other members of their families to mail to their congressmen and Senators as well. We just can’t do that because it is far too expensive to look up individual congressmen and Senators for someone’s address and mail them cards at the regular postal rates. If you would like to have post cards for others I encourage you to use a regular post card or print out a letter for friends or family members to mail. The language we are using can be found at our site on the Internet at www.TerrorPostCard.com. There is a link at that page directly to a data base to obtain addresses of congressmen and Senators by entering a zip code. I urge you to help us get as many of these cards to Congress as possible. A few folks have told me they didn’t mail their cards at all saying, “My congressman is a lost cause.” The ones that are a “lost cause” are the most important to write to because a large number of cards and letters shakes the confidence of their staff. In the last fight to block funds to Sunni Muslim fighters in Syria, we were able to muster votes from both Republicans and Democrats. To both the liberals and the conservatives our message is the same: When the Sunni rebels win, the Christians are driven away, killed or enslaved. We must stop this insanity. How can we fight Islamic terror by sending guns and money to the Sunni terrorists already supported by the Sunni King of Saudi Arabia and Qatar? This is the same Saudi king who finances all the Islamic schools in the United States that teach hatred of Jews and Christians and declare that democracy is an “apostate religion” that must be destroyed. We are being heard, we are getting our message out and we must continue to bring to the attention of our elected officials, the news media and the public that there are no “good Islamic rebels” anywhere in the world. Our leaders in Washington should have learned that by now from the number of Afghan and Iraqi soldiers we trained, who then gunned down our troops right there on our own bases. Giving guns to young bearded Muslims is just not a good idea. The Houston Sermon Situation: I am sure you are aware of the demand made by the City of Houston and its lesbian mayor that pastors must hand over copies of their sermons for examination. The city actually obtained a court ordered subpoena to obtain five pastors’ sermons to examine them for “political” comments made about Mayor Parker’s rather bizarre city ordinance which allows men who think they are women to enter women’s restrooms and vice versa. Mayor Parker, who is “married” to another woman, does not want anyone to be allowed to be critical of her deviant lifestyle. This is not just a gay agenda issue; it is about a very real danger to religious freedom and therefore freedom of speech in this country! If the lesbian Democratic mayor – a favorite of Barack Obama’s – succeeds, a precedent will be set such as exists in Canada and most of Europe where they censor all religious speech the government does not like. In the United Kingdom a pastor can go to jail for insulting Islam, as an example. Do we want that here? Senator Ted Cruz of Texas did take action immediately and held a news conference with the pastors in Houston, including the pastors whose sermons had been demanded Mayor Annise Parker. 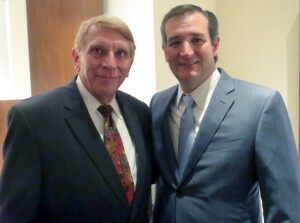 Or course this was of a great interest to Senator Cruz because he is from Texas, and he plans to run for President in 2016. But, it is important to get as many elected officials involved as possible on the state and federal level. As soon as I became aware of this assault on religious liberty in Houston, I contacted congressmen and Senators who had not spoken out about the dangers posed to our basic rights and freedoms. I have called the various Chiefs of Staff of Congressmen and Senators I have working relationships with, urging them to get out statements on behalf of their bosses — which many have done. We can’t have government at any level censoring the pulpits of this nation! 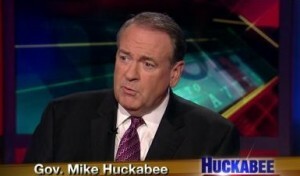 I very much support the efforts of Governor Huckabee and others to stop this outrage. If a church can be ordered to hand over materials or even censored, then a non-profit organization such as this one can be as well. What if radical leftwing Attorney General Eric Holder were to decide that our post card program to Congress insulted Islam? What if he were to demand all of our internal records to see if we “discriminated” against Muslims? This move by government at the city level to interfere in the pulpit must be stopped, or it will spread among politically correct left leaning cities and states and ultimately the federal government.